The spectacular "World Wine Tour" presents the different global landscapes where vines are cultivated. "The Art of Living" explores the various aspects of wine sharing across the world to the ancestral art of wine service. 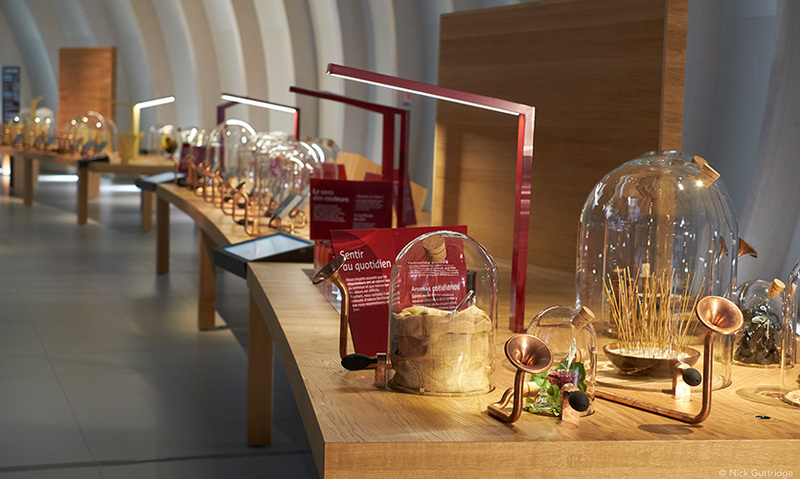 The "Buffet of the Five Senses" gives visitors the chance to smell a selection of the more unusual scents of wine. "All Aboard!" is a fully-immersive, 270-degree cinema, shaped like the prow of a boat. "The Terrior Table" allows visitors to "meet" the wine-growers and hear their stories. 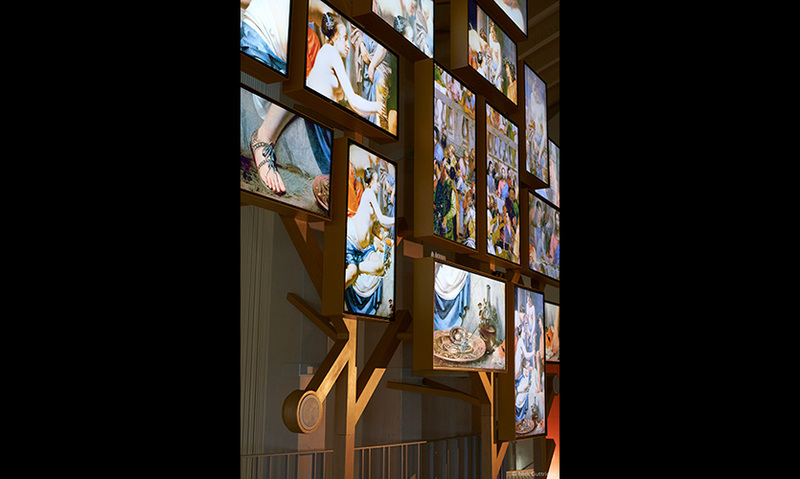 "Divine Wine" is where visitors immerse themselves in wine's sacred dimension through a striking mosaic of music, poetry and texts. Visitors lie in repose at "Bacchus and Venus," gazing up at images of wine and love swirling across the domed ceiling. 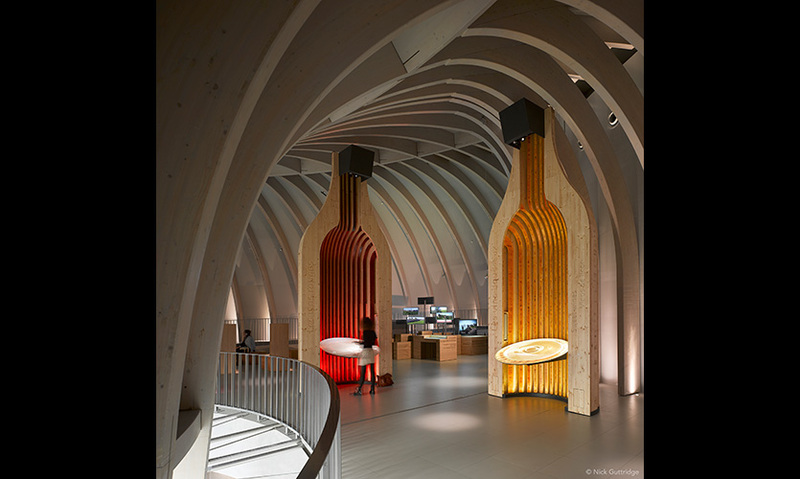 La Cité du Vin, which opened in June 2016, is the world’s largest visitor center dedicated to the story of wine. The permanent exhibition designed by Casson Mann, is a spectacular, innovative and playful series of displays that form a rich and entertaining visitor experience. Welcomed by wine experts, appreciated by critics and thoroughly enjoyed by families, the new exhibition has transformed people’s expectations of a wine museum. Spread across a floor space of more than 3,000 square meters, nearly 20 different themed areas take visitors on a journey of discovery through the history and culture of wine. 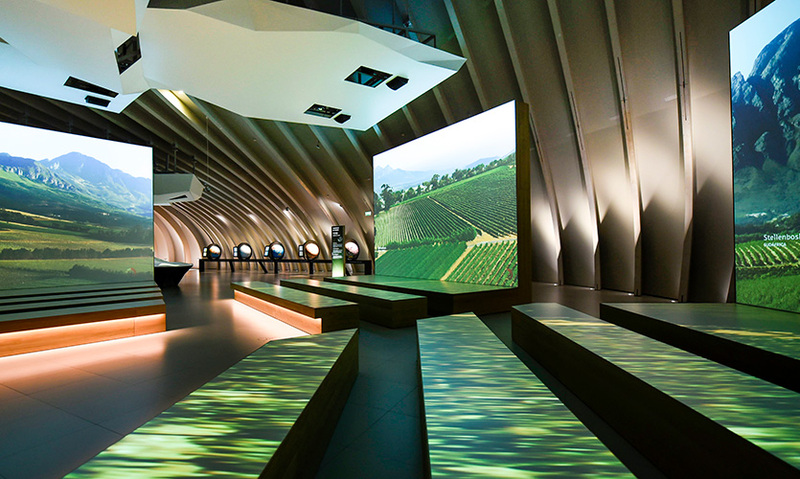 The exhibits range from large-scale, cinematic fly-overs of the world’s most stunning vineyards, to tactile digital interactives. The design team placed an emphasis on sensory interaction, with dreamy immersive displays as well as aural and aromatic delights. To sustain visitor interest across the space, Casson Mann drew on the spectrum of interpretative design techniques, creating changes of scale, mood, pace and tone, allowing for moments of rest as well as intensity. The visitor experience starts with the spectacular “World Wine Tour,” an immersive film experience which plays out over three enormous screens, presenting the different global landscapes where vines are cultivated, from high mountain ranges to sandy coastal plains. Casson Mann was responsible for the art direction and final editing of the film, creating dynamic contrasts, sequenced perfectly between the three screens on a huge scale. The next exhibit, the “Terroir Table,” includes film shot at the same vineyards, but here visitors are able to “meet” the wine-growers. The aim of the exhibit was to bring visitors face-to-face with these men and women, to hear their stories. Visitors watch and listen to the film and explore the interactive table. 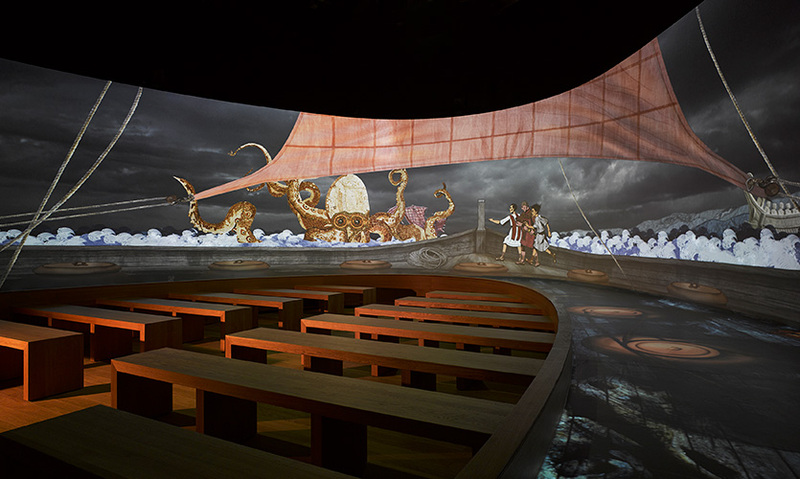 Touching the documents, maps and books that are projection-mapped on the table, visitors trigger new events and animations, which bring deeper content to life. 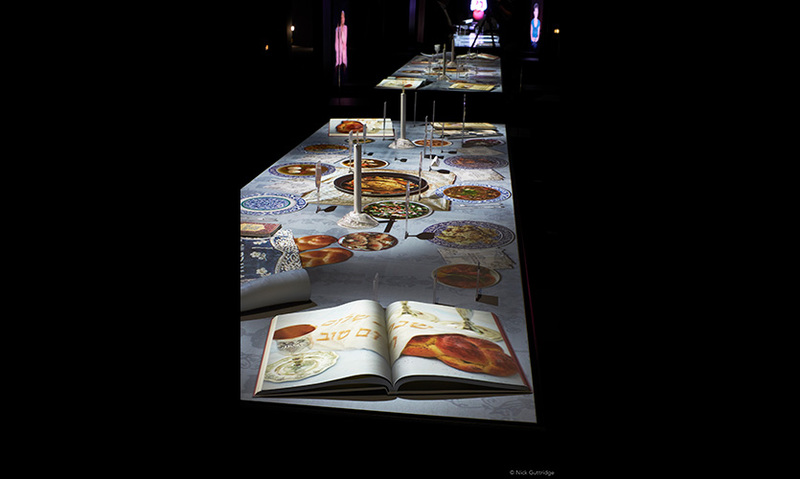 One of the highlights of the visitor experience is the “Buffet of the Five Senses,” a series of interactive displays, developed in consultation with a leading French perfumer, that awaken the senses, giving visitors the chance to smell a selection of the more unusual scents of wine, from leather and pencil shavings to burnt matches and old books. The exhibits take their inspiration from old apothecary equipment and Victorian theatre, with glass cloches, copper trumpets and atomizers, brought to life by digital media. Visitors can go on a “boat trip” in “All Aboard!”—a fully immersive, 270-degree cinema, shaped around the prow of a boat; they can join a dinner party of illustrious wine-lovers, including Winston Churchill and Napoleon. Then, to repose, visitors head for “Bacchus and Venus,” lying back on a sofa and gazing up at images of wine and love swirling across the domed ceiling. 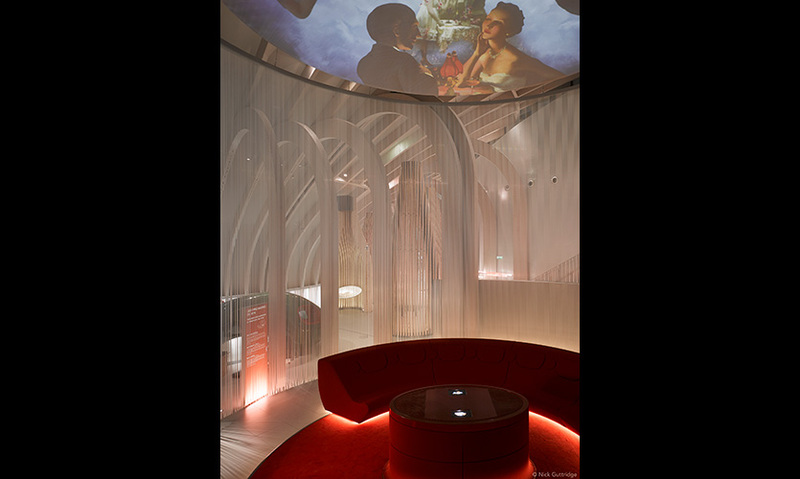 The visitor experience is playful, and, while it was developed with rigorous attention to detail and the input of France’s leading oenologists, it is suitable for families. It is complemented by a handheld digital media guide, which Casson Mann helped develop, which offers interpretation in eight languages and access to additional content. "All of the human senses are activated at Le Cite du Vin. 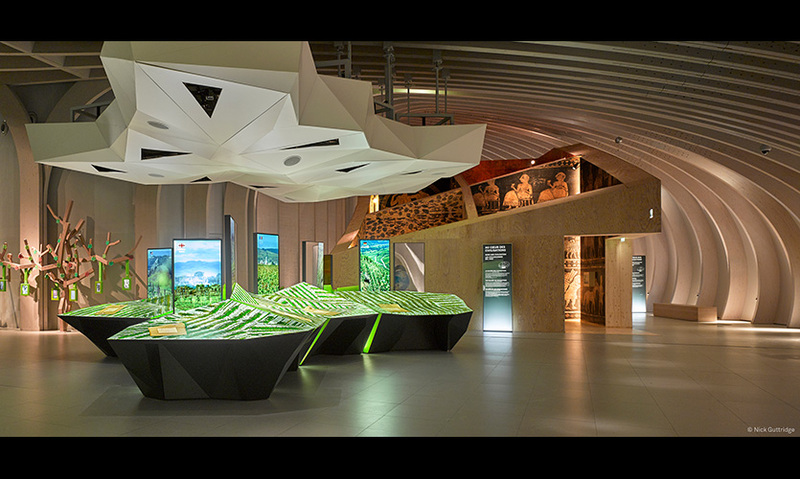 The museum tells the story of wine, from historical significance through modern production techniques using immersive interactive stations, stunning visual communications and unique application using the latest display technology." "A beautifully crafted and elegant space. Uniformity of form and material with subtle color pops and careful integration of objects and digital media move visitors through playful yet educational spaces."